Trump appeared on the Bloomberg television broadcast “With All Due Respect,” and at one point, interviewer John Heilemann asked Trump to expound further about a comment he made recently that the Bible is his favorite book. Heilemann continued to seek an example. “There is no verse that means a lot to you that you think about about or cite?” he asked. 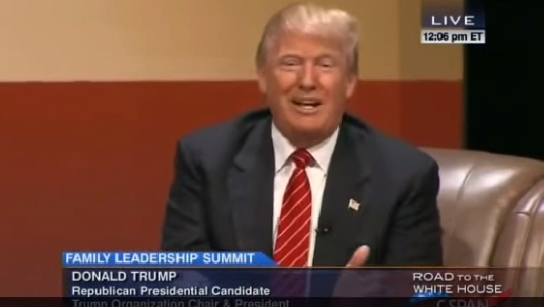 “The Bible means a lot to me but I don’t want to get into specifics,” Trump responded. “Even to cite a verse that you like?” Heilemann said. Co-host Mark Halperin then spoke up. “Are you an Old Testament guy or a New Testament guy?” he inquired. As previously reported, Trump raised concerns among some last month after had been asked by moderator Frank Luntz during the Q&A segment of the event whether he has ever sought forgiveness for his sins. The Republican presidential candidate further outlined to CNN’s Anderson Cooper that he doesn’t always see a need for forgiveness.